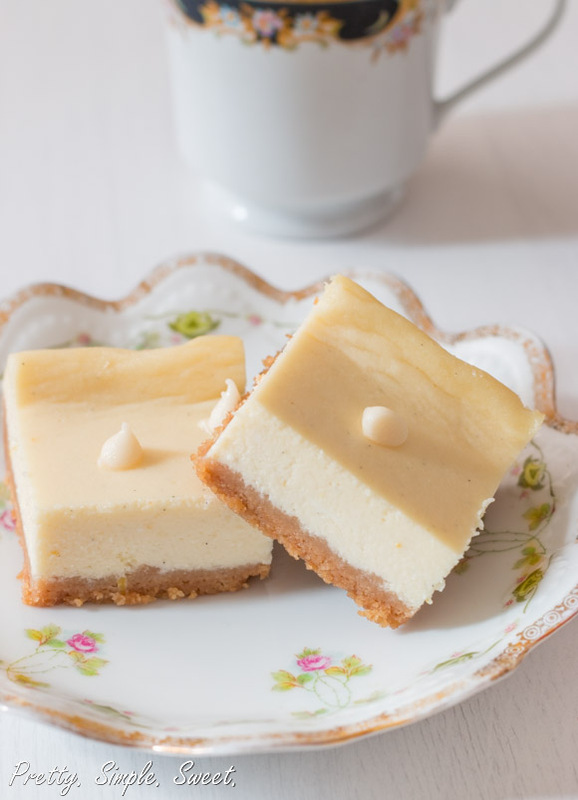 Lemon White Chocolate Cheesecake | Pretty. Simple. Sweet. Rich, decadent cheesecake with a lemony scent, mixed with melted chocolate to make it even creamier. Since the combination of lemon and white chocolate was such a hit in these cookies, I’ve decided it’s time to try a new dessert with these two ingredients. After a long time of deep thought (around 3 minutes), I finally decided that cheesecake would be the perfect choice. 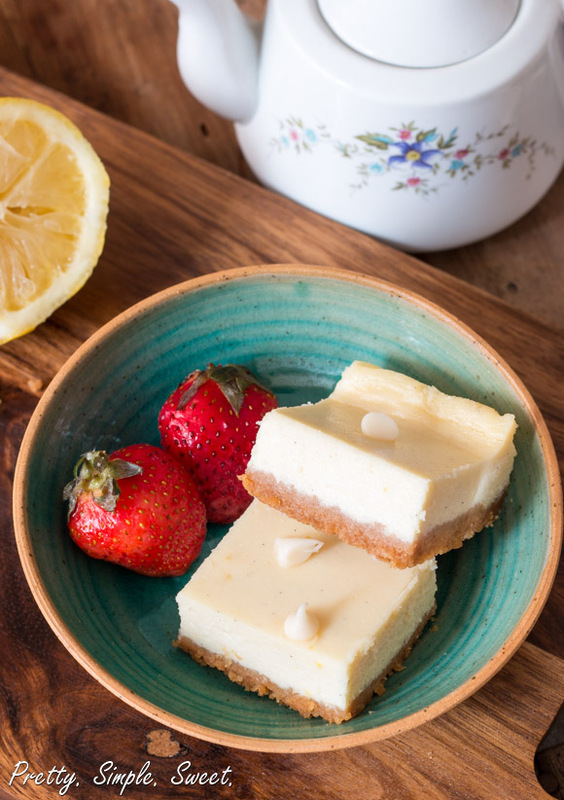 I’ve tried plenty of white chocolate cheesecakes before, and they’re always so good! 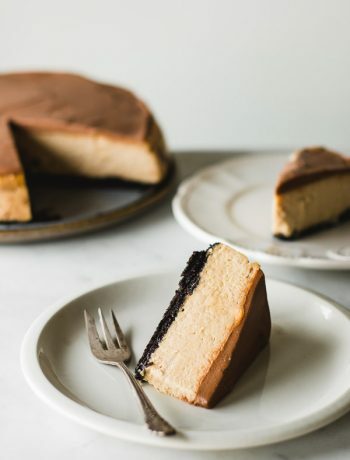 The white chocolate makes the creamy dessert even creamier, creating a wonderful texture, and since the chocolate is sweet, the result is a less tangy cheesecake. 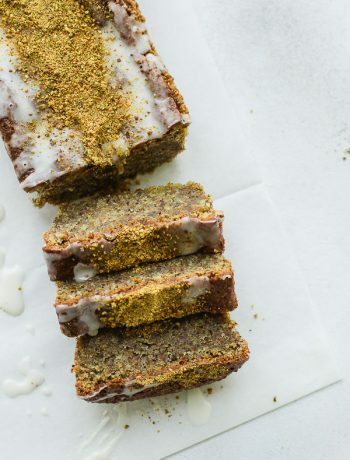 Thus in this recipe, the addition of lemon simply makes it perfect. I don’t know about you, but I love my cheesecakes rich, so in addition to cream cheese and white chocolate, I added heavy cream to the batter. If you’re on a diet, just run away as soon as you can – this cheesecake won’t be doing you any favors. 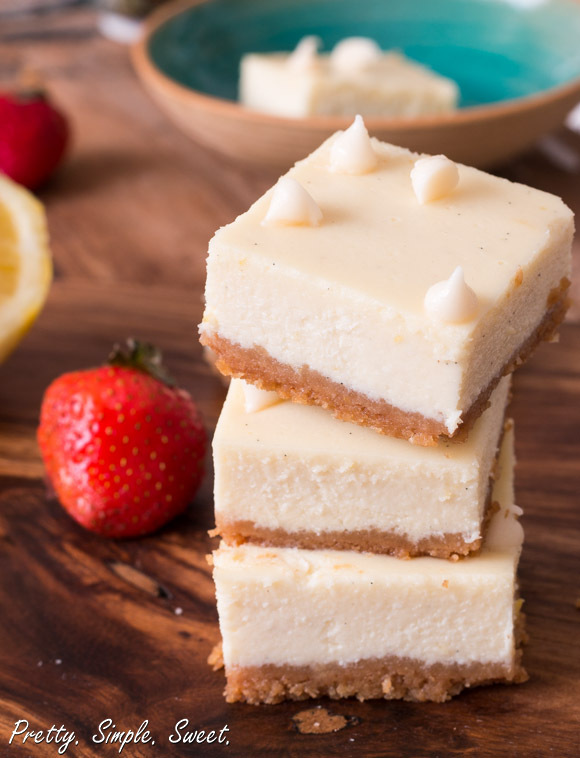 Instead of making a tall, round cheesecake (that usually uses doubles the amount of ingredients required), I like to bake my cheesecakes in a square pan and serve them as bars. I’ve found that it’s much easier that way! 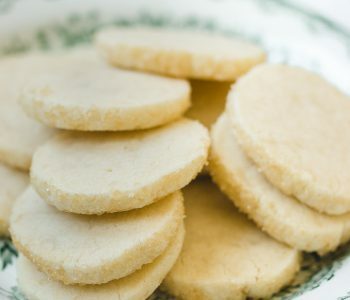 For the crust, I almost always use crushed wafers or cookies that I mix with melted butter. Why bother with anything else? It’s the best crust ever, especially if we’re talking about Oreos! Just try this snickers cheesecake and you’ll understand what I mean. I also prefer to bake my cheesecakes at a lower temperature than the standard 350F/180C degrees. 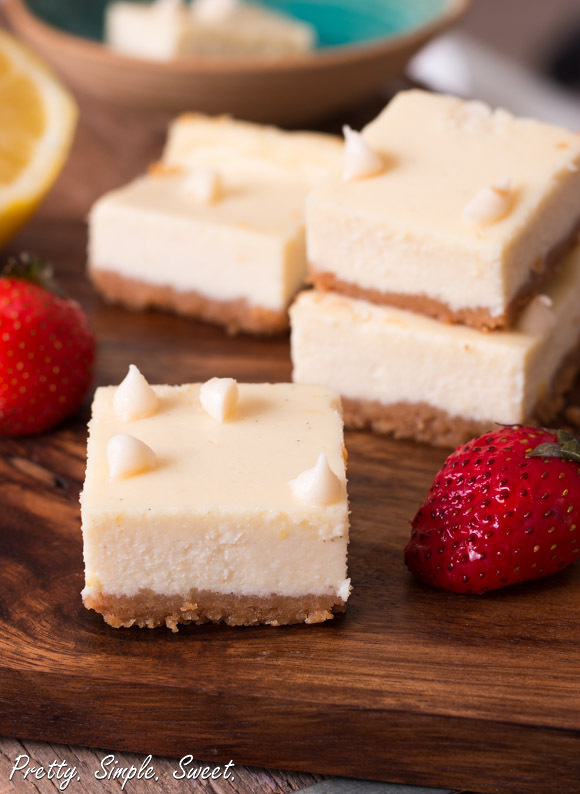 A cheesecake’s texture suffers in high heat, so it’s best to bake it at a lower temperature for a longer time. If you’ve ever seen a recipe for cheesecake that suggests using a waterbath, that’s the reason why: it cooks the cake at the perfect temperature while also keeping it moist. 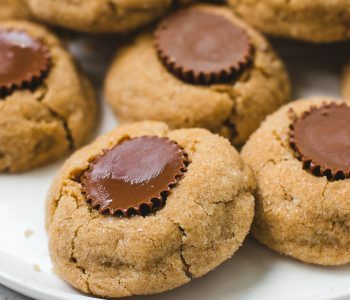 Since I want to make your life a bit easier, I suggest baking this dessert at 300F for about 45 minutes – no waterbath needed. While baking, remember to never wait until the center is set; it should still be slightly wet and wobbly when you take it out. If it’s already set, that means you’ve over-baked it. By the way, I was unbelievably close to adding some white chocolate chips to the batter since I have nearly zero self-control when it comes to chocolate and sweetness. Somehow, though, I was able to hold back and I’m glad I did! The cheesecake came out precisely as I wanted it. It’s rich and sweet exactly as it should be. Preheat the oven to 350F/180C. Line an 8×8-inch baking pan with parchment paper, leaving enough overhang on the sides for lifting the cheesecake out after baking. In a medium bowl, stir the crumbs and melted butter together. Put mixture in the lined pan and gently press with your fingers until crumbs form an even layer. Bake for 8 minutes. Allow to cool while you prepare the filling. Reduce oven temperature to 300F/150C. In a medium heat-proof bowl, combine the white chocolate and heavy whipping cream. 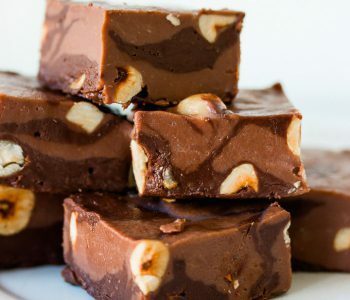 Melt in the microwave in 20 second-intervals, stirring between each interval, until melted. Alternatively, set the mixture over a saucepan of simmering water, stirring occasionally. In a mixer fitted with the paddle attachment, beat cream cheese on medium speed until smooth, about 1 minute. Add sugar and beat for another 2 minutes. Scrape down the sides and bottom of the bowl as necessary. Add eggs, one at a time, until fully combined. Add vanilla, lemon zest and juice and beat until incorporated and smooth. Stir in the chocolate mixture and mix until combined. Pour batter over the cooled crust and spread evenly. Sprinkle with chocolate chips if desired. Bake for about 45 minutes. The center of the cake should be slightly wobbly when it’s taken out of the oven. Allow the cake to sit at room temperature for 1 hour, then refrigerate for 4 hours (or, preferably, overnight) until completely set. Lift the cake out of the pan using the parchment paper and cut into squares. 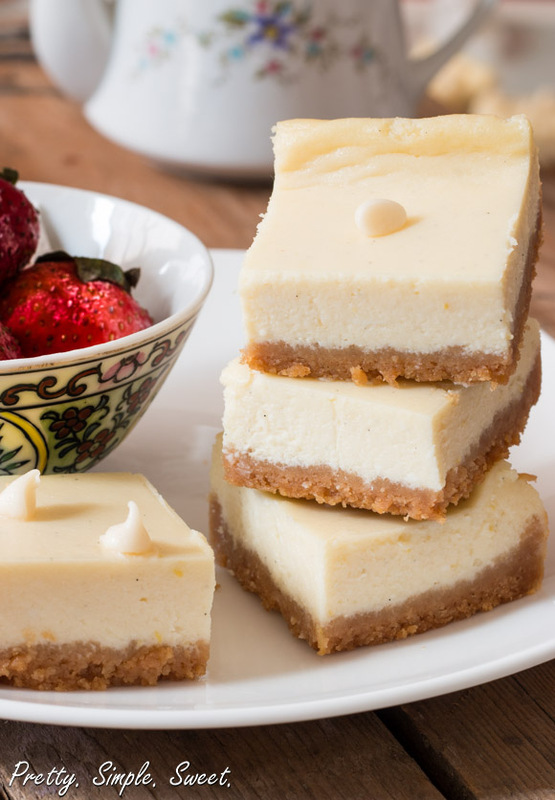 Cheesecake bars taste best after 24-hours of refrigeration. 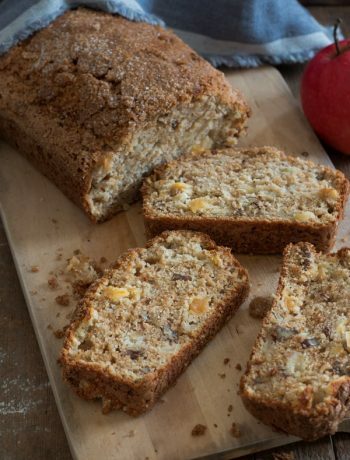 You can double the recipe and bake it in a 9x13-inch pan for 50-60 minutes. 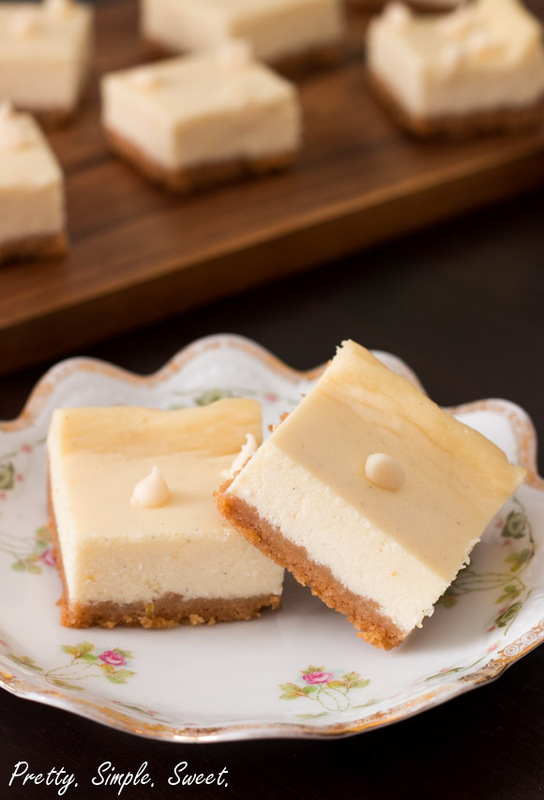 Store cheesecake bars in an airtight container in the refrigerator for up to 5 days. Oh so delicious! These would be at hit at the all the picnics this summer. 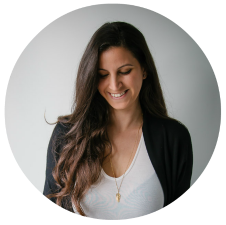 Have a wonderful Wednesday Shiran! Thank you so much Kathi! Hope you are too! 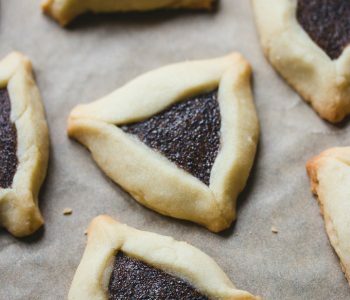 קודם כל אני מאדדדדדדדדד אוהבת שוקולד לבן, ובטח שעוגות גבינה עם שוקולד לבן, ואכן אין כמו השילוב של לימון עם שוקולד לבן, ובעצם לימון עם גבינה. Wow! I love white chocolate and those look perfect! Have you ever tried baking them in mini muffin cups? I find that those give the perfect serving. Thank you Chitra! I added it to the recipe, sorry about that! All you need to do is add it to the batter. This recipe was amazing! Sooo delicious and a big hit with my family. It balances the tang of the lemon and the smooth creamy sweetness of the white chocolate perfectly. 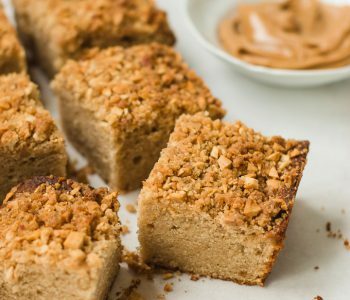 I think I’d like to try a traditional graham cracker crust next time though, just to cut some of the sweetness. The only thing that was confusing for me was knowing when the cheesecake was done! It was all pretty jiggly and not brown at all, so I kept it in for 15 minutes extra. It was still jiggly, so I just decided to take it out. After cooling for an hour it fully set, and once refrigerated, it hardened to perfection! Also as a side note: this is probably obvious to everyone else but I should have cut the parchment paper at the corners of the 8×8 pan to make it lay flat against the sides and form perfect squares. Mine are a little rounded looking, but great to eat nonetheless.